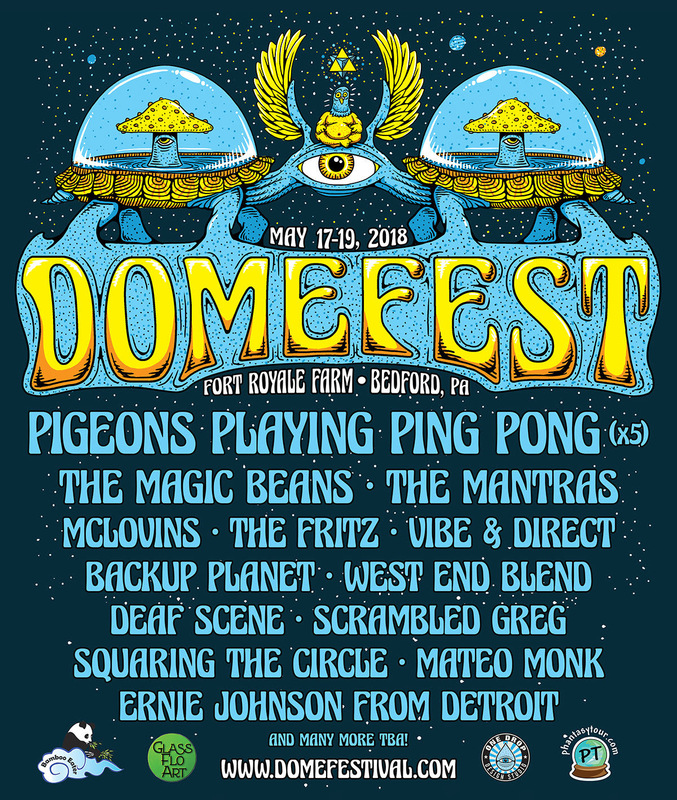 For the last nine consecutive years, Pigeons Playing Ping Pong have curated an annual festival titled Domefest and the 2018 installment is set to take place May 17 – 19th at Fort Royale Farm in Bedford, PA. Tickets are on sale today, January 12th at 1 pm EST and can be purchased here: www.mt.cm/domefest-2018. It has now been nine years since then college senior Schon stumbled upon the original location of Domefest outside of College Park, MD. The dome-shaped roof and the proximity to the University of Maryland’s campus inspired the guitarist — who was profoundly impacted by his own festival travels — to organize his very own one-day, one-night music and camping festival simply for his friends to enjoy. While the festival has expanded into three days and nights, grown in size and cemented itself as the ultimate gathering of the Flock (the so aptly named fanbase of the band), it remains true to its roots. Domefest consistently books some of the best under-the-radar talents in the live music space, with festival alumni including Papadosio, Twiddle, Turkuaz, Tauk and Aqueous, to name a few. Artists are encouraged to intermingle with their fans and as a festival curated by touring musicians, Domefest aims to make it a meaningful experience for every artist invited to play. The initial lineup includes five sets from the Pigeons themselves — who always treat their Domefest crowd to plenty of surprises and musical twists — plus performances by The Magic Beans, The Mantras, McLovins, The Fritz, Vibe & Direct, Backup Planet, West End Blend, Dead Scene, Squaring The Circle, Mateo Monk, Ernie Johnson From Detroit with more to be announced. Pigeons’ Ormont is even scheduled to play a special solo set under his moniker Scrambled Greg this year. Stay tuned to Domefest’s official website, Facebook page and event page for future announcements including artist additions, complimentary workshops and ticketing updates.